The Friday kebabs were a hit and I was hit with the request for more kebabs. The hard part was that the former were made with leftover turkey & ham that I cubed. I have no turkey or ham, so I improvised. 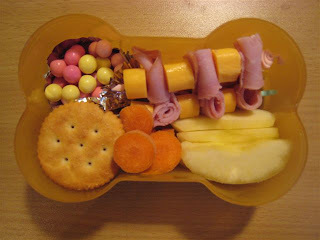 She had kebabs made with rolled up ham and cheese, crackers, slices of apples, slices of baby carrot (not for looks but because I couldn't cram them in the box in full form), and Yogos for a treat because she "really really really loves yogos".